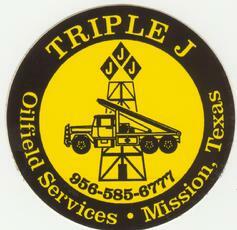 Triple J Oilfield Services, Inc. SERVING THE SOUTH TEXAS OIL INDURSTY SINCE 1994. WE STRIVE FOR SAFE & SUPERIOR EMPLOYEE PERFORMANCE AND CUSTOMER SATISFACTION. Our mission is to provide quality transportation services to the oilfield industry in the most safe and efficient manner. Also to create a safe and clean work environment for our internal and external customers. To be a leader in providing transportation services to the oilfield market in the most safe and defect free environment. It is the intent of Triple J Oilfield Services, Inc./Triple J Transport, Inc. to provide a safe working environment in all areas for all employees. Accidents and injuries are prevented by controlling the work environment and the actions of the employees; therefore safety will take precedence over expedience or shortcuts. Every attempt will be made to reduce the possiblity of accidents occuring. Protection of employees, the public as well as company property and operations in paramount. Management considers no phase of the operation more important than the health and safety of the employee. Triple J Oilfield Services, Inc./Triple J Tansport, Inc. is committed to safe operation.